Tonga Begins Cleanup of Powerful Cyclone's Damage - Integration Through Media ....! 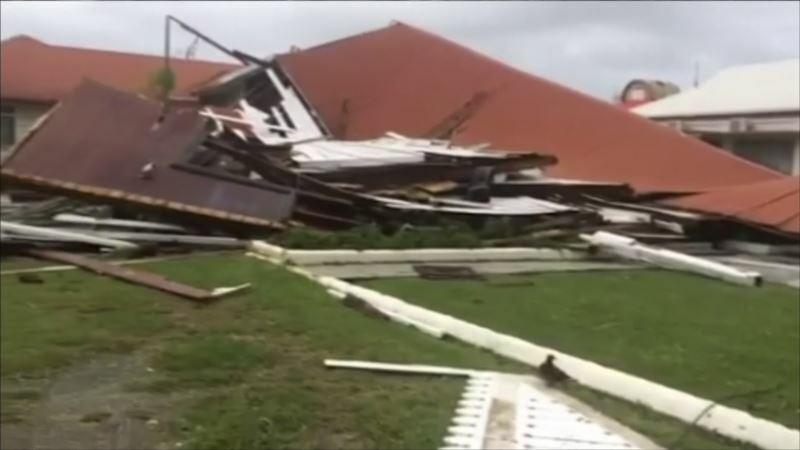 (VOA): Residents of Tonga are cleaning up after Tropical Cyclone Gita ravaged the Pacific island nation, even destroying the historic Parliament House, with winds exceeding 200 kilometers per hour Monday night. The storm ripped trees out of the ground, tore roofs off houses and buildings, knocked down power lines and caused massive flooding in the capital, Nuku'alofa. Even the Tongan Meteorological Service lost its roof, forcing it to hand over the job of issuing warnings about the cyclone to its counterpart in Fiji. Storm damage closed the international airport, along with the Australian High Commission, which warned its citizens against traveling to the devastated kingdom. The cyclone was intensifying and was forecast to hit some southern Fiji islands Tuesday night, though it was likely to miss Fiji's major population centers, including the capital, Suva. On Tonga, acting Prime Minister Semisi Sika declared a state of emergency, urging residents to stay where they were to prevent injury and avoid further damage to property or the environment. New Zealand's Foreign Affairs Minister Winston Peters said more than 5,000 people stayed in evacuation centers overnight during the storm. Several people were reportedly injured in the storm, and a 72-year-old man died of a heart attack, although it was unclear whether his death was related to Cyclone Gita. New Zealand donated over $500,000 in emergency aid to Tonga and deployed a military aircraft with emergency supplies to the island. Australia also was sending a military aircraft filled with emergency supplies to the island. More than 5,000 miles away in PyeongChang, South Korea, the most famous face of Tonga was competing in the 2018 Winter Olympics. Cross-country skier and Tongan flag bearer Pita Taufatofua, 34, followed the storm from South Korea and tried to make contact with friends and family. On Tuesday morning, Taufatofua announced on social media that his family was safe.